The Professional Regulation Commission (PRC) and the Board for Professional Teachers (BPT) announced today, May 23, 2015 that 12,103 elementary teachers out of 44,144 examinees (27.42%) and 17,904 secondary teachers out of 56,596 examinees (31.63%) successfully passed the Licensure Examination for Teachers (L.E.T.). 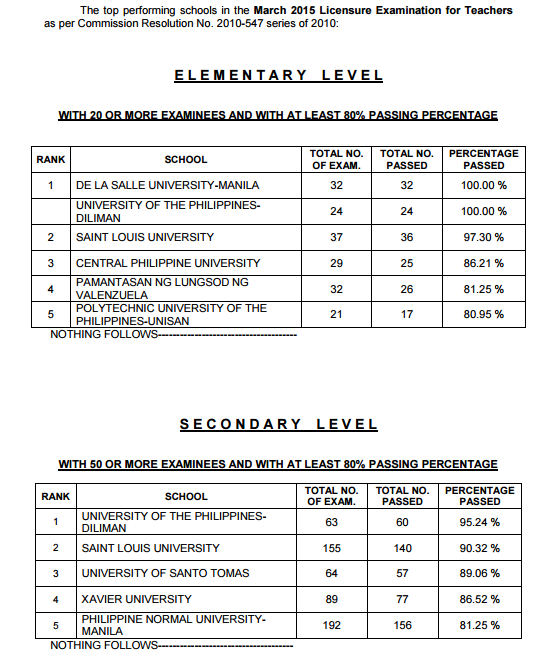 According to PRC, De La Salle University (DLSU)- Manila and University of the Philippines (UP) - Diliman topped the schools for Elementary Level for obtaining 100-percent passing rate. For Secondary Level, PRC named UPD as the top performing school as per Commission Resolution No. 2010-547 series of 2010. UPD got 60 out of 63 passers or 95.25 passing percentage.